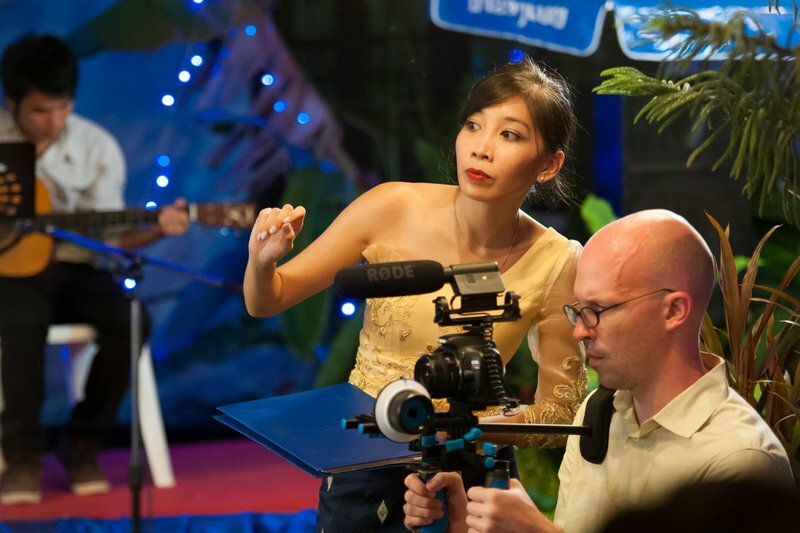 Mattie Do, Lao’s first female feature film director, has been chosen to participate in La Fabrique des Cinemas du monde at the Cannes Film Festival and Market this May 2014. Mattie’s first film, “Chanthaly“, was the only Lao film to have received international attention from various film festivals abroad such as Fantastic Fest in America, Hong Kong Asian Film Festival, Flimmer Film Fest in Sweden, and Abertoir Film Festival in Wales, UK. Following the success of “Chanthaly“, Mattie was offered the opportunity to apply for the Fabrique program, an amazing opportunity for producers and directors of developing nations to grow their film projects and attempt to find funding at the Cannes Film Market while being mentored one on one with a successful director and producer. “Laos has never had this opportunity before, and even when I applied, I didn’t think it was even a remote possibility I could be accepted. Attending and participating in the activities of the Cannes Film Festival and Market is a dream come true! It’s an honor that Douangmany Soliphanh and I can go to represent Laos during this historic event,” said Mattie Do. This will be the first time that Laos will have a presence in the Cannes Film Market and Festival, known as the largest and most prestigious film event in the world. “Nong Hak” (English title: Dearest Sister) will be the film presented at the Cannes Film Market and is Mattie Do’s second film. It will star pop superstar Totlina Vilouna of KPY and Amphaiphun Phommapunya of the film “Chanthaly“. “Nong Hak” is being made with the generous support of Pepsi, Lao Brewery Company Ltd. ?????? ? ?, ??????????????????????????????????????? ?, ?????????????????????????????????????????????????????????????????????? ???????????? ???? ????????????????????????????????? Cannes ????????? ??????? ?? 2014 ???. ??????????????????????? ?????? ?? ?????????? : “??????? ?” ??????????????????????????? ?.?.? ???? ???????????????????????????????? ?????????????????????????????????????????????? : Fantastic Fest ?????????????? ?, Asian Film Festival ???????????? ?, Flimmer Film Fest ???????????????? ?, ??? Abertoir Film Festival ??????????? ?, ??????????????????. ??????????????????????????????????????????? “??????? ?” ????????? Mattie ??????????????????????????????????????????????????????? ?????????????????????????????????? ???????????????????? ??? ???????????????????????????????????????????????? ?????????????????????????????????????????????????????????????? ??? ????????????????????????????????????????????? ?????????????????? ???? ????????????????????????????????? Cannes (Cannes Film Festival and Market) ????????????? ?, ??????????????????????????????????????????????????????? ?????????/????????? ????????????????????????? ???? ?????????????????????????????. ???????????????????????????????? ?.?.? ??? ???????????????????????????????????????? ???? ????????????????????????????????? Cannes, ?????????????????????????????? ????????????????????????????????? ??? ?????????????????. ??????????????? “??????? ?” (??????????????????? : Dearest Sister) ???????????????????????????????????? ?????? ? ?, ?????????????????????????????????? ???? ????????????????????????????????? Cannes. ?????????????????????????????????????????????? ??????????? ???????? ???????? KPY ??? ????. ?. ????????? ??????????? ??????????????????? “??????? ?” ???????????. ??????? ?, ??????????????? “??????? ?” ???????????????????????????????? ?, ????????????????????????????????????? Pepsi, ????????????????????????????? ?.